It’s all too easy to follow his first piece of advice and then neglect to follow the rest. The root of the problem lies in our desire to impress. Thesaurus carpet-bombings and long-winded sentences are commonly mistaken for fine writing, because they feel authoritative and intellectual. But they’re just masks; effective writing is lean, clean, and easy to read. It’s difficult putting thoughts to page without losing a little luster along the way. In that spirit, here are a few of my favorite lessons on the dark art of polishing your first draft. In every paragraph Lanham revises, wordiness sneaks in out of laziness, or because the author wanted to turn a plain statement into a pompous profundity. 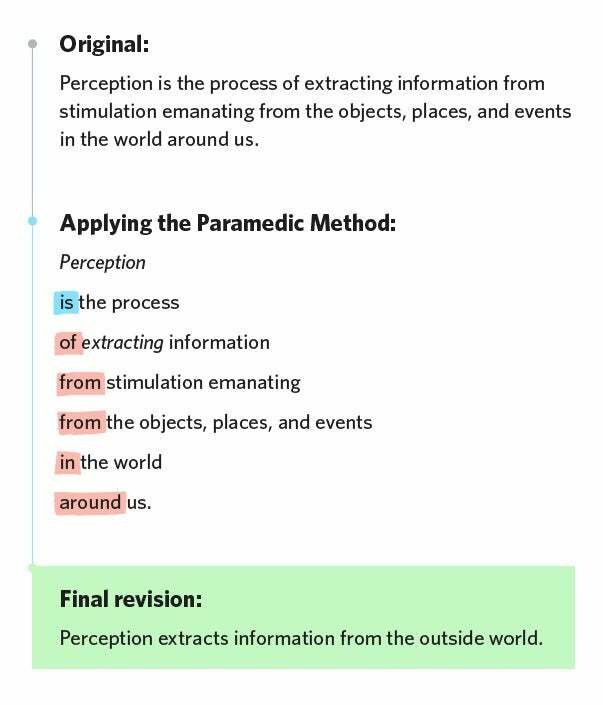 The Paramedic Method took the sentence from 21 words down to 7, a 66% reduction in “Lard Factor,” as Lanham says. When stripped of their excess, the concern isn’t that these passages haven’t said anything profound; it’s that they haven’t said anything at all. The cost of confusing a colleague is high, but what about the cost of confusing yourself? Great writing moves you effortlessly through the words; reading becomes as quick as thought. 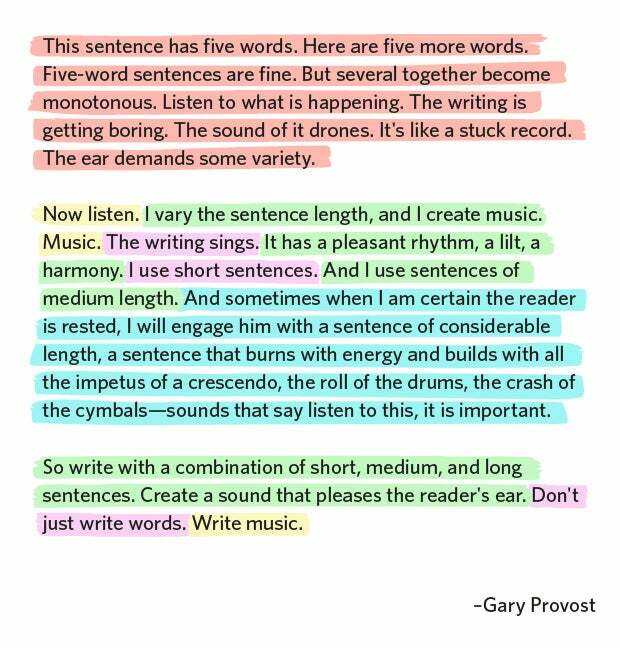 Part of mastering flow, this “music” in writing, means understanding the interplay between short and long sentences. The stamina of a long sentence can build a tense, winding climb to the climax; like a roller coaster slowly ascending to the summit. In contrast, the economical short sentence is best suited to drive home a revelation. In every instance, a short sentence brings momentum to a halt; the interruption must be used to make a statement with teeth. Repetition weakens impact, so you’ll only have a handful of opportunities in each piece. Make them count. Novelist Neil Gaiman once said that writers find their own voices only after they’ve sounded like a lot of other people. On the road to writing your own seminal sentences, start by studying those that have stood the test of time. Quotes, sayings, and maxims have a way of staying with you long after you’ve read them; author Cody Delistraty says it’s because they are both a syntactical triumph and a visceral victory. Learn by example rather than rules. You’ll only be able to generate great sentences if you know what they look like. A selfless writer uses creativity to better illustrate his or her message. From the words chosen to the pictures painted through metaphor, the aim is to bevivid — a tricky blend of clear and imaginative. Leaving Seraphina with Castro, and sticking the remaining pair of pistols in my belt, I swarmed up the rope. Strong writers routinely find such moments by digging past the surface. I’m reminded of Jason Fried’s use of “patina” to depict how an authentic company culture forms over time. If you draw from the well of imagery, use what you find to heighten feeling, not flash. Your readers want to see what you see. Show them. In this way, all good writing is humble. Hiding your toil is the final gift you must give your audience. They won’t know of the discarded drafts, or of the work, worry, and grief spent on your best attempt at an enjoyable final product. They won’t know, because you made it look easy.